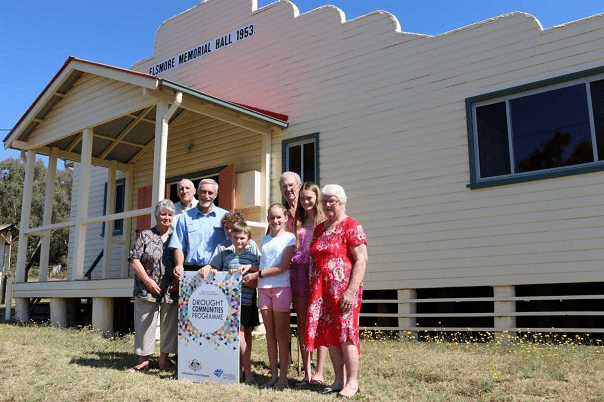 ELSMORE Hall has received a shot in the arm this week with news they will receive $32,000 to fund major improvements, which will commence this month. Inverell Shire Council mayor Paul Harmon visited Elsmore Hall recently to congratulate committee members who will use the funds to install solar panels and a new playground. Cr Harmon says funds for the project have been secured from the Federal Government’s Drought Communities Programme, which focuses on projects that engage local tradespeople and spend dollars within the Inverell economy. “What’s fantastic about this funding stream is Council is able to partner with the Federal Government and we can provide funds to relieve the pressure on communities like Elsmore that are doing it tough”. “We know these halls are the lifeblood of small villages and Elsmore Hall is beautifully kept, neat and tidy. Wayne and his committee run regular events at the hall and solar panels will enable them to do other improvements down the track with the savings alone”. “The new playground equipment will also be fantastic and will be a big benefit to families and children attending functions at the hall”. A delighted Hall president Wayne McKinnon explained the solar panels will curb electricity expenses, with the committee set to save around $1,000 per year following the installation. “The cost of power bills is a real killer for our committee and in twelve months’ time, we expect to have more in the kitty which means after a couple of years, we can start doing more and more and not have to rely on grants to keep us going”. Built in 1953, the spick and span timber hall is run by a committee who host a lively calendar of events which include monthly new vogue dances the second Saturday of every month, an annual Christmas tree celebration and charity events. Committee member and avid historian Mavis Ting helps host the monthly dances, which attract between 30-40 people and says she encourages even inexperienced dancers to join them on the dance floor. The next dance will be held Saturday 9 February from 8pm at the hall, which is a 15 minute drive from Inverell. Image: L-R Prue McGee, Wayne McKinnon, Mayor Paul Harmon, Daniel Bernard, Adam McKinnon, Tammsin McKinnon, Vince Ting, Kaitlyn McKinnon and Mavis Ting.